When we began to get really serious about researching possible expat destinations, the world became surprisingly small. For several reasons, expat living in Central America — or the northern tip of South America — were our best options. Reason #1—I wasn’t going to volunteer to be half a world away from my (American) kids. Reason #2—Canada didn’t interest us. This was one time I was happy to be wrong—we ended up meeting each other somewhere near the middle. After reading several expat books, magazines and blogs, and pulling from our own travels, Costa Rica, Ecuador, Panamá, Belize, Nicaragua and Colombia were considerations in our first round of researching expat living in Central America. Researching expat living in Central America. ☑️ SOMEWHERE WE FELT COMFORTABLE & SAFE. The grid, drivable roads, indoor plumbing, hot showers, a decent grocery store, a few good restaurants, and personal safety were musts for both of us. Having each been there in our former married lives, Ken and I had a soft spot for Costa Rica—but, not so much for its roads. The same terrain that makes the country so stunning prohibits an extensive freeway system. Neither of us wanted to rely on hopper flights, local drivers and/or horse-pulled carts to get us to and from our destinations so this was a serious strike for Costa Rica. Since it’s hard to relax when your life is in danger, a stable government, reasonable crime rate, and effective police department were also non-negotiables. 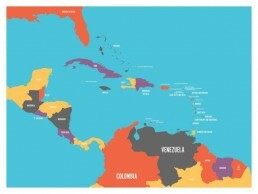 According to recent crime index rankings of the Americas, Costa Rica ranks 12th, ColOmbia 16th, Ecuador 17th, and Panamá 19th; the U.S. ranks 18th. Another (surprising) strike for Costa Rica. Sadly, three seasons of Narcos completely destroyed our ability to relax in Colombia. The Department of State website says this about Belize—”Violent crime, such as sexual assault, armed robbery, and murder, is common. Local police lack the resources to respond effectively to serious criminal incidents.” Bye, bye Belize. There’s political corruption in every country—and it’s inescapable in Central America. But, Panamá and Ecuador were both solidly democratic with freedom of press and speech and legit elections. It was a huge bonus for us that there is no military in Panamá and that the canal acts as a political and economic safety net. Thanks to general-turned-dictator Noriega’s takeover, Panamanians got rid of their military and created the national police, which is truly just a police force. The U.S. has guaranteed to protect Panamá’s territory should it ever need help. Not only does the canal fund the country’s infrastructure (including good roads), but it also provides consistent jobs for its residents and is one reason for a the country’s thriving middle class. Ecuador appears to struggle a bit more economically, largely due to an unsustainable deficit. Yikes…four countries nixed before we even got to #2 on our checklist! We moved (nervously) on with only two remaining contenders for expat living in Central America — Panamá and Ecuador. ☑️ A COUNTRY & CULTURE THAT FIT US. When it came to the people, food and culture, both Ecuador and Panamá excited us and we were confident that we’d be able to assimilate. Again the canal benefitted us in that it’s made Panamá historically and presently accustomed to foreigners amongst them. In terms of weather, no matter which country we chose, we were looking at a pretty equal amount of heat, humidity and rain. I might have drooled when we saw the images of Panamá. There was no shortage of places where the jungle met the surf—and word had it that the surf was good. So, we’re left with Panamá. I was NOT expecting to be left with only ONE country for possible expat living in Central America after checking off only two items on our list! Seven more items on the list—I was officially worried. ☑️ A LOWER COST OF LIVING. Like most expats, one of our primary reasons for moving was a lower cost of living. We quickly realized that stability, safety and comfort come at a cost, so we quickly adjusted our savings expectations a bit and made a point to look at the quality of our new life as well. Fortunately, we were coming from one of the most expensive areas in the U.S. In San Diego, a decent condo in the city limits will set you back about a half million—add the sound of the ocean or a view of the sunset and you’re easily over $1,000,000. Groceries for two (healthy) eaters costs about $500-$600 a month and dinner and drinks out is at least $75. Don’t even get me started on healthcare. If we hadn’t lost Costa Rica over roads, we would have lost it here. For relatively similar amenities and surroundings (like the ocean), property in Panamá was quite a bit cheaper. The cost of living in Panamá—excluding rent—is about 25% lower than the average of all U.S. cities (probably a bit higher for we San Diegans); rent in Panamá is about a third lower than the average of all cities in the U.S. Based on our desired living standards, which I would classify as “Shabby Clean,” we were optimistic we could get it as high as 60%…IF we were going to rent. Preliminarily, it looked like we could live for at least 25% less than we currently were, while seeing (and possibly hearing) the ocean and sitting under a tree! Hopefully, we’ll save more than this on real estate or we’re in trouble! ☑️ A LENIENT AND AFFORDABLE RESIDENCY PROGRAM. Friendly Nations Visa—an option for entrepreneurs from any of 47 “friendly” countries (which includes the U.S.!). A local bank account with a minimum of $5,000 is a requirement, as well as one of the following—a minimum $10,000 real estate purchase, opening a business or getting a job. Forestry Investor Visa—a temporary resident visa that requires a minimum $60,000 (Small Forestry Investor) or $80,000 (Large Forestry Investor) investment in reforestation. With the “Small” version, you’re required to re-apply every year for a total of six years, at which point you have the option of applying for permanent residency; with the “Large” option, after two years, you can renew and apply for permanent residency with the option of applying for citizenship five years after obtaining permanent residency. Professional Residence Permit—an option for those who want to work in Panamá at a job that’s not reserved for Panamanian nationals, such as real estate, medical professions, law and accounting. A university degree is required and there’s a two-year checkup to confirm that you’ve been employed for the previous nine months and have been paying into social security. Of course, our future attorney will let us know, but the Friendly Nations Visa looked like a viable route for us. ☑️ THE ABILITY TO EARN AN INCOME. The whole low cost of living thing throws a wrench in the whole employment thing—life is significantly cheaper when demand is lower and demand is lower when there are far fewer economic opportunities. This is definitely the case in Panamá—especially outside of Panama City, which is definitely where we’d go. And, to throw another wrench into the equation, the one job that was the most realistic option for us was real estate sales and, as I mentioned above, this is reserved for permanent citizens. Even if you can find a job, the pay is likely to be painfully low. As long as I have high speed internet, I’m hopeful I can continue my website design and virtual assistant business. I also plan on having some sort of vacation rental. Both of these endeavors require some boots on the ground research to see if they’re truly viable. Ken’s a different, more challenging, story—too young to retire from a highly specialized career, too old to want to start over. Rather than let this stop him, he’s optimistic that hard work, relationship building and cashing in some good karma, he’ll be able to find a job, investment, or entrepreneurial opportunity that’s a good fit for him. ☑️ EASY TO GET BACK HOME. Anything under 18 hours checks this box. In general, getting to Panamá from most parts of the U.S. is definitely less than this. ☑️ SAFE TO INVEST & OWN PROPERTY. Expat living in Central America wasn’t going to happen anywhere we couldn’t invest and/or own property. After my divorce, I did the 2012 version of keeping my nest egg under the mattress, so I was even shocking myself by seriously considering investing a sizable chunk of it in another country. But, real estate is in my investment comfort zone and I refused to let fear keep me down. Being long-time investors and owners, it’s difficult for Ken and I to return to a rental mindset and, to be honest, torturous to imagine other people making money while we paid them rent. Plus, running a rental property in a rental property made zero sense. Thanks to more than dozen laws on the Panamanian books (and constitution), foreign investors have the same property rights as citizens. There were plenty of amazing properties for at least 33%-50% of the price of equivalent properties in Southern California. The purchasing process seemed pretty similar to what I was already familiar with, with the exception of the lack of escrow companies. As long as we worked with a reputable and qualified attorney who would ensure any property we bought had a clean title and that we fully understood all terms of the contract, we were (reasonably) safe. Property taxes were almost exactly what we were used to—2.1% of the recorded value for properties valued at $30,000 and higher. Most of what we read indicated that Panamá is moving in a positive direction, largely due to increasing investment by foreigners who see the sizable gap between property values and quality of life. ☑️ OUR ABILITY TO LEARN THE LANGUAGE. Our brains are a little tired, but Spanish is doable. The last thing we wanted was to suffer (or worse) from inadequate healthcare in our new expat country. Thankfully, my research revealed that Panamá’s healthcare system is reasonably good. Medical professionals are well trained. It’s not uncommon for doctors to have been schooled in the U.S. and to spend lots of time with their patients, even giving you their mobile or home phone numbers. Not all of them speak English, but a fair amount do. There are both public and private hospitals in Panamá. Although the former are free or extremely cheap, most people tend to go the private hospital route because of their shorter wait times and superior level of service. There are several state-of-the-art private hospitals that are affiliated with U.S. medical facilities. Punta Pacifica in Panama City is a Johns Hopkins Hospital. One of the biggest flaws with Panamá healthcare seems to be inconsistency in quality and service—in both public and private hospitals and physicians. Also, difficult medical problems may pose more of a challenge in Panamá than in the U.S. In general, Panama City offers the best healthcare, but popular expat areas are stepping it up in order to be competitive. Fortunately, Panamá is a small country so you’re not likely to be more than a few hours from a modern hospital. I was bummed to find out that health insurance IS necessary. There are many PPO and HMO plans available that cost much less than the U.S. and, absolute worst case scenario and last resort, there are some U.S. health insurance plans that work in Panama. One big difference from the U.S. is that many of the private hospitals offer a membership plan, which give members discounts on services performed at that facility. Out of six countries, Panamá was the only one that survived our expat checklist! All of our research on expat living in Central America, and Panamá in particular, has us very optimistic and excited—not because we’ve found a perfect country, but because we’ve found somewhere that has the ability to feel even better than home at a fraction of the cost. Hey Janet, that’s quite the story! Looks like you put a lot of thought into your move. When will you be finished with the transition? Ken may be moving down there as soon as early 2019—I’m looking at moving in about 18 months. We’re working with the architect on designing the property now. It’s Panama, so it’ll take about that much time to finish this part of the project! Sorry to be snarky, but if you didn’t even bother to learn how to properly spell the name (it’s Colombia not Columbia) then not sure just how knowledgeable you are. If watching Narcos was the lit of your research, then you obviously aren’t qualified to pass judgement on the city. Medellin is actually a wonderful city. Had my heart not already been set on Coronado, Panama I very well may have retired there. I did work in Bogota for a year and a half and never felt in danger. I visited Medellin as well. There certainly are areas not to go to in the country, but the same can be said for certain parts of the US. Snark is totally allowed here 😄. I’ve actually read and heard many wonderful things about ColOmbia, which is why (even after 3 seasons of Narcos) it was even briefly considered. I’m very excited to visit there. I definitely don’t consider myself an expert or even very knowledgeable about ColOmbia…but, at 51, I’ve learned to to listen to my gut and said gut just wasn’t okay investing my irreplaceable nest egg in a country that was ruled by a drug lord who was considered a hero by a significant number of its citizens. I understand your hesitancy to invest in Colombia, it is in a time of change right now. The last election was very close. Just as the Darien is not safe in Panama due to the FARC and criminal elements, Colombia has it’s no-go areas. That said, Bogota, Medellin and Cartagena are not places that worries me a bit. I lived in Bogota a d visited the others. Like all large cities there are parts to stay out of, but again, it is a different country than it was in the days of Escobar. Wherever you end up, as long as you keep and open mind and realize you are no longer in the US I am sure you will find what you are looking for! Enjoy the adventure. I also heard that their healthcare is excellent and many Panamanians go there for medical services. Thanks very much for your input…can’t wait to visit! No matter where we are, there will definitely be adjustments. But, honestly, I’m so ready not to be in the U.S. anymore…for awhile anyways. Great post! We are visiting Panama in January to scout retirement locations. I don’t want to be in the U.S. for too much longer, but we are about five years out. Good luck! Thank you! I hope it helps you in some way. I’m so ready to leave the U.S. too…18 months and counting. Keep in touch and let’s share info! My next post will be about our reconnaissance mission. Life is busy so it’ll probably be about a month before that’s up. Thx so much for all this info!! I’m a Canadian citizen with a green card married to an American with a Panama Relocation tour booked for Jan 26. We r more than ready to escape the current US craziness!! Ready to relocate in 1 yr. Toured and Love Costa Rica…toured and ruled out Belize…now on to Panama to rule out one or the other of the remaining two. Then we go! Would love to hear your continuing story. You’re very welcome! I look forward to hearing about your trip to Panama. Let’s definitely stay in touch. If you sign up for the email list, it comes right to me and we can compare notes some more! Colombia and Ecuador are in South America, not Central America. I’m glad I stumbled across your website! My husband and I did similar long term research and planning and even considered the same countries. We landed on Panamá for all the same reasons. We made the move in August of 2017 to the sleepy fishing village of Pedasí. No regrets! We are lifelong homeowners, but have opted to rent. It gives us the flexibility to see other parts and even neighborhoods in the Azuero. Our good friends live in Cañas and frequent visits are tempting us to try a rental there as well. Looking forward to meeting you and Ken some day soon! I’m SO happy to hear this!!! (OK, not about the Gama guilt 😝). Looks like we’re going to be neighbors 🤗We’ll actually be in Pedasi very soon…if you email me at info@vistacanas.com, we can try to connect! Hi Janet. My husband and I are headed to Panama in April for our first look around. We are hoping it is our “near Perfect” place, as there is no Perfect place. We are both military brats, so moving almost comes naturally for us. Having said that, it’s still a BIG deal to think about moving to another country to live for….hopefully forever. (Who knows). I have grown boys here and one grandson. I’ve been told if we move there my Grandson will be spending summers with me. lol So much to think about, wonder and worry. It will be an adventure. Can’t wait till April ! I can so relate! It’s hard to volunteer to go so far from my kiddos (and future grandkids), but what a fabulous place for them to visit, right??? Keep in touch…I’m going to be so curious if you find your place and, if so, where that is. I’m getting ready to write my next post on our “reconnaissance mission”!